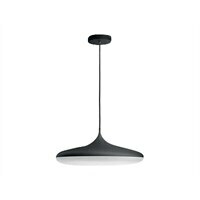 Philips Hue White ambiance Cher - Pendant lamp - LED - 39 W - blackWith the Philips Hue white ambiance Cher semi-flush light in your home you can easily control the light routines for every moment of the day. Use the dimmer switch to set the right light that helps you relax, read, concentrate and energize. With the Philips Hue white ambiance Cher semi-flush light in your home you can easily control the light routines for every moment of the day. Use the dimmer switch to set the right light that helps you relax, read, concentrate and energize.